How does the preamp compare to the one in my mixer? 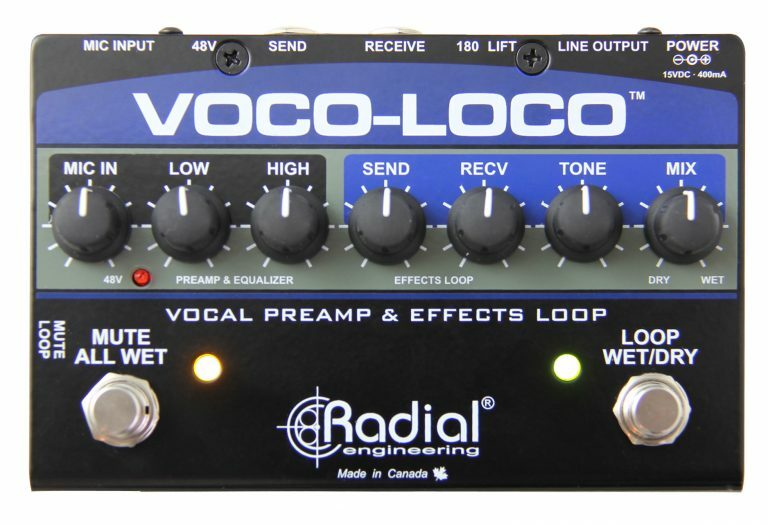 The Voco-Loco’s preamp is a high performance low-noise preamp with Radial’s unique Accustate gain control. This eliminates the need of a separate pad while delivering excellent signal-to-noise at all levels. Very few live PA mixers can boast this level of quality. Can I connect the output from a DI box to the Voco-Loco? Yes. The Voco-Loco can be used with both active and passive direct boxes. Can I use 48V phantom power instead of the 15VDC supply to power the Voco-Loco? No. 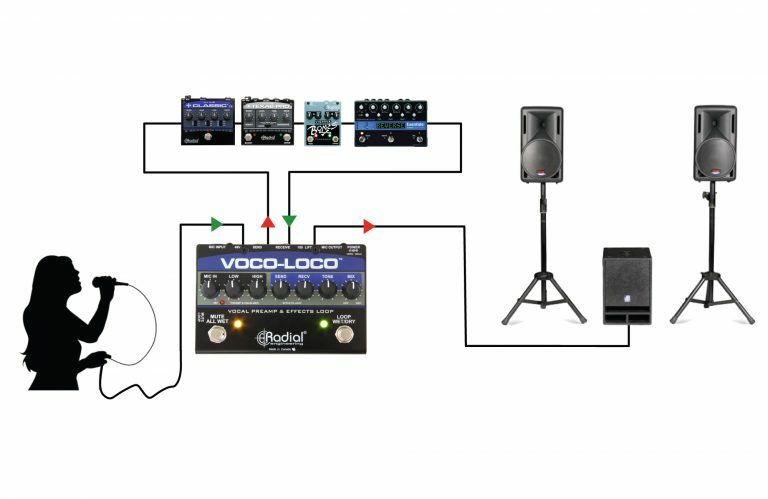 The Voco-Loco combines a preamp, EQ, effects loop and phantom power generator in one box. Phantom power itself does not have sufficient current to perform all of these tasks. This is why the Voco-Loco comes with a 400mA 15VDC supply. Can phantom power damage a microphone? It is unlikely. Dynamic mics are not affected by phantom power. Only older ribbon mics can be damaged by phantom power. Simply check with the mic manufacturer if you are not sure. What is the benefit of having a mute switch? 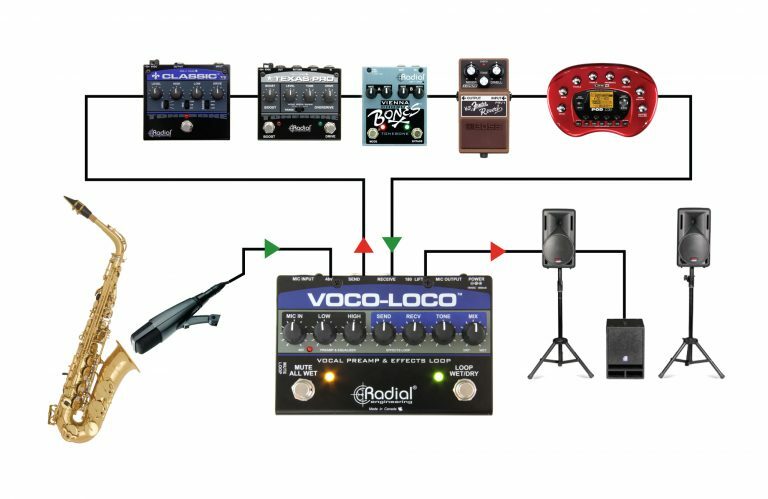 Turning off microphones or direct boxes when not in use will help reduce stage feedback. This also eliminates bleed from one sound going into an adjacent microphone which makes it harder to mix. Muting a vocal mic also enables the performer to cough or speak to other band members discretely. Can I use studio rack effects in the Voco-Loco’s effects loop? Yes. Most studio effects devices are equipped with unbalanced inputs. Can I harm guitar pedals by driving them too hard? No. They may distort, but they will not be harmed. Voco-Loco has been designed to work within the constraints to ensure trouble-free performance. Can you explain the difference between mic and line levels? A mic level is a very low signal that is produced by the microphone. It is typically -40dB below the nominal 0dB reference point and must be connected to a mic preamp input as found on most mixing consoles. The output from a professional mixer or studio preamp is a +4dB balanced line level signal which is significantly louder. The Voco-Loco is in fact a preamp that produces a line level output. 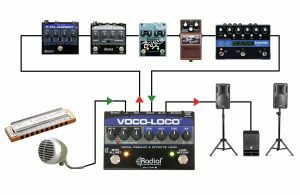 Will the Voco-Loco overdrive the input of my mixer? It can. If you hear distortion, simply lower Voco-Loco’s output or reduce the input sensitivity on the mixer by inserting a pad or turning the trim level down to compensate. 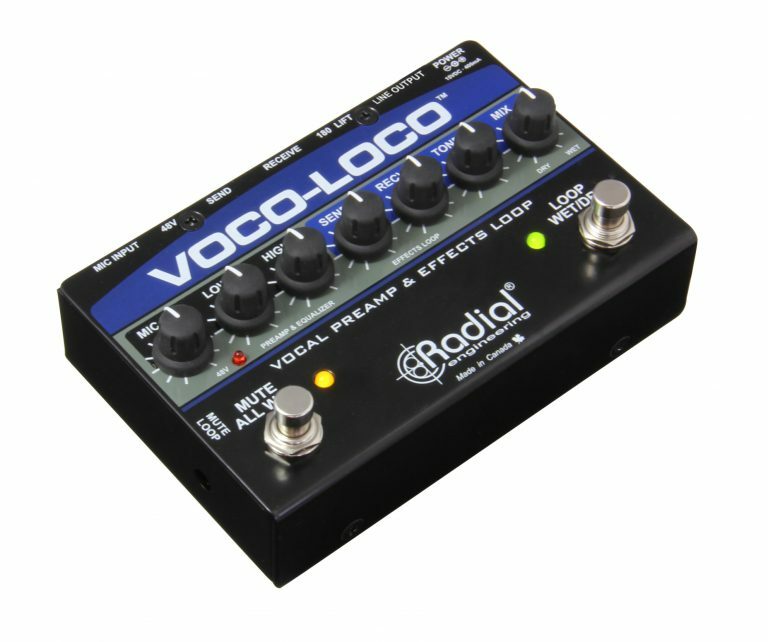 Can I use the Voco-Loco in the studio? Absolutely! The Voco-Loco produces a super clean sound that is perfectly well suited for studio use. And there’s nothing more effective at making a track stand out than adding cool effects to a vocal passage or harmonica passage! 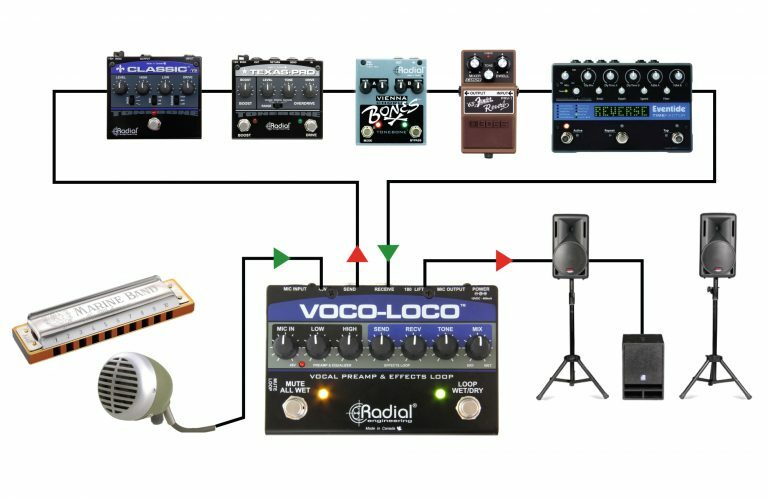 Can I connect the effects loop output to a guitar amp? Why not? For lowest noise, make sure the amp and Voco-Loco share the same power outlet. Can I use the Voco-Loco with any instrument? Yes. The Voco-Loco is no different than any studio mic preamp. It takes whatever microphone signal you put in and lets you process it using effects. 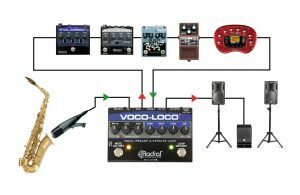 Can I use the Voco-Loco as a mute for on-stage communication? Yes. And because it generates 48V phantom power, you can use it with either condenser or dynamic microphones. Can you explain ‘bleed’ and how it causes problems on stage? The term ‘bleed’ comes from one instrument sound leaking into another. A drum set next to a vocal mic is a good example. So when you turn up the vocal, you also add more drums to the mix! You can reduce bleed by turning off mics when not in use. This makes it easier to mix and reduces opportunity for feedback. How do I simulate the sound of a traditional blues harp using pedals? A traditional blues harp setup includes a Shure Green Bullet mic and a small stage amp like a Fender Champ that is driven into distortion. With the Voco-Loco, use a dynamic mic and insert an overdrive and a reverb into the effects loop. You can also add a chorus pedal to create a vibrato effect. How do I simulate a lead guitar effect using a saxophone? Lead guitar solos typically incorporate distortion with echo. Combine a distortion pedal like the Tonebone Classic with a flanger and a delay pedal in the effects loop and you will be surprised at how guitar-like your sax will sound! Can I use a high impedance microphone such as the Shure “Green Bullet” with the Voco-Loco? Yes. However, for a better sound, it is recommended that you use a direct box such as the Radial ProDI to convert the signal to a low-impedance balanced microphone signal before the XLR input of the Voco-Loco. Is the main XLR output of the Voco-Loco mic or line level? 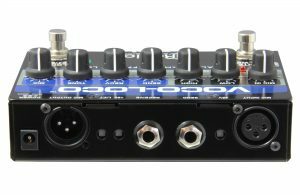 The Voco-Loco is a preamplifier and produces a line level output that can be directly connected to a mixing console. Can an unbalanced looper pedal be used with the Voco Loco? If so, what is the best way to connect such a pedal? Yes, you can insert an unbalanced loop recorder to the effects loop of the Voco Loco. Adjust the send and return levels on the Voco Loco for optimal signal without distortion, and set the Wet/Dry mix to 100% wet to ensure that only the looper is heard. Is the Voco Loco’s effects loop in series, or parallel to the circuit? What is the difference? 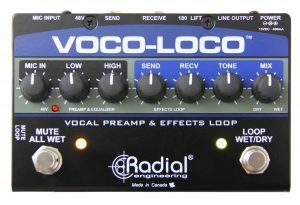 The Voco Loco has what is considered to be a parallel effects loop. Series effects loops (most common) interrupt the circuit of the pedal, with 100% of the signal being routed out of the box for processing. This signal is then re-inserted into the circuit via the return jack, and only the effected audio remains. 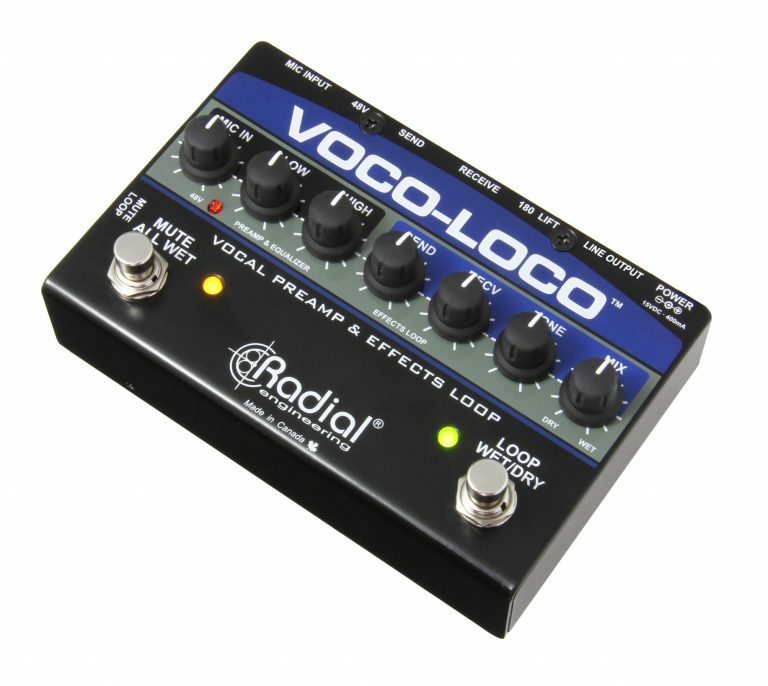 Parallel effects loops, like what is found in the Voco Loco have two separate signal paths. The first allows the original, un-effected audio to run through the pedal untouched as if there was no effects loop. The second path is the loop itself, where 100% of the signal is outputted to your effects, and returned to the pedal. These two separate paths are then blended together using the Wet/Dry control, which gives you the ability to mix the two signals to achieve the perfect balance.